Stunning Collection Of Aromatherapy Perfume. I think when most people think of aromatherapy perfume, they think of the single notes. Beautiful rich and fresh smelling elixirs created from nature's most fragrant bounty. Who can resist the two types of magnificent rose perfumes, freesia Eau De Cologne or the wonderful lavender Eau De Toilette? This wonderful collection of aromatherapy perfume took many years before it was ready to be released. It was a complete labour of love getting the scents just right. No need for descriptions really, imagine the flower on a balmy summers evening and there you have your scent. Not artificial, not synthetic...simply, the flower. This has a sensuous deep and romatic floral scent. The essential oil from its white roselike flower is used to promote peace and healing. 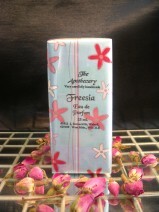 A very striking aromatherapy perfume. For matching soap and other products - visit here. 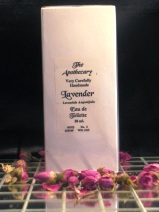 Lavender Eau De Toilette is a timeless classic. 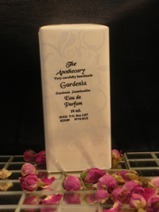 All our aromatherapy perfumes are also produced as Eau De Cologne or the very special Eau De Parfum. One of my childhood memories is that my aunt would always wear freesias to any wedding! I absolutely loved their sweet heady scent, and even now I am transported back whenever I smell them. Why not give yourself an extra special treat with matching toiletries? Needs no description - how beautiful!! 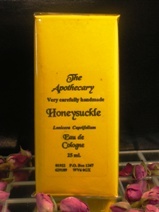 Keep the honeysuckle fragrance clean and light by using products that are made from the cologne. 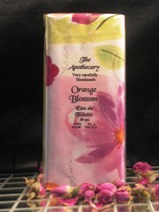 In many countries the bride should have orange blossom in her bouquet to prepare her for the evening ahead. A very light orangey fragrance, also known as neroli. Make a really thoughtful gift...her complete trouseau. Imagine the deepest red rose. This is made from the absolute by laying thousands upon thousands of petals in fine vegetable oil and letting them absorb in the hot eastern sun. What if you could too? 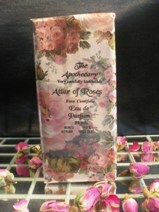 If you love rose, have a look further down the page at the attar of roses aromatherapy perfume. 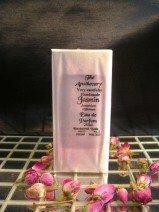 Jasmin is quite simply the most seductive and exotic fragrance I know. This is an aromatherapy perfume with a very distinct purpose! Make your scent last longer - match it with your toiletries. Match your aromatherapy perfume with other products in the range. Heliotrope perfume is a timeless classic, with its vanilla like, almost powdery scent. This single note aromatherapy perfume is both sweet and elegant. 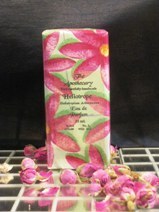 One customer tells me that she simply cannot live without her matching heliotrope soap!! 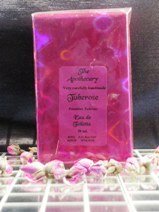 Tuberose has a lovely floral, honey like fragrance and is said to have slightly narcotic undertones. 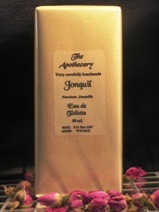 This is a truly precious perfume as in times gone by, the essential oil was litterally worth its weight in gold. This flower is specifically used to dispel negativity and to lift ones spirit. 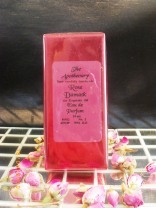 Attar of roses can also be called Rose Otto. Interestingly, this essential oil is extracted by steam distillation rather than by enfleurage like the absolute (Rose Damask). Just as valuable but a softer, slightly lighter scent. A completely sublime aromatherapy perfume. People who bought Attar or Roses also bought matching rose products from here. Lily of the Valley Perfume. 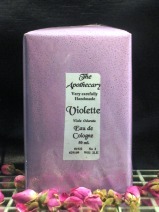 Beatiful toiletries to match this fragrance- Lily of the Valley heaven! Looking for a blended aromatherapy perfume? Click here!! Did you know that The Apothecary is an amazing reputation for healing medical complaints? See some of our treatments.